Greenwich linebackers Mozi Bici (42) and Evan Weigold (2) celebrate a turnover in Greenwich's 29-0 win over Staples on Thursday in Greenwich. GREENWICH — Greenwich’s defense has displayed such dominance this season that scoring just one touchdown against it has been an accomplishment for its football foes. “We take pride in getting shutouts, seeing that zero on the scoreboard feels great,” Cardinals senior linebacker Jack Feda said, following Greenwich’s game against rival Staples Thursday — a matchup that saw the team once again, excel defensively. Following its impressive trend, Greenwich did what Feda described, holding yet another opponent off the scoreboard, while keeping its perfect season intact. 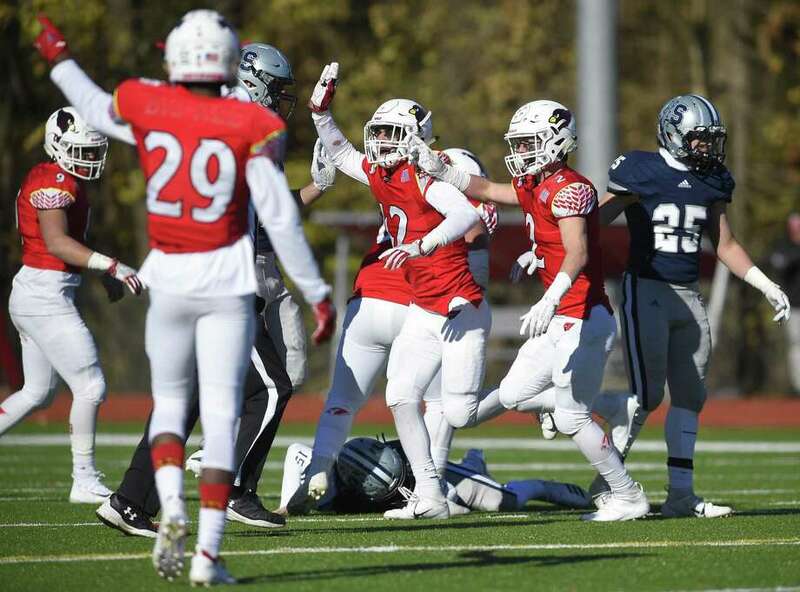 Dynamic on defense and efficient on offense, Greenwich concluded an undefeated regular season by upending Staples 29-0 in a Thanksgiving Day FCIAC game at frigid Cardinal Stadium. It was the fourth shutout of the season for the Cardinals, who have allowed just 41 points in 10 games. With the win Greenwich also clinched its second-straight FCIAC championship. The Cardinals, who have beaten Staples on Thanksgiving three straight seasons, are currently ranked third in the Class LL standings. If Norwalk defeats Brien McMahon on Friday, then Greenwich will move up to No. 2 in the ranking and will host New Britain in Tuesday’s Class LL quarterfinals. Should McMahon beat Norwalk, the Cardinals will be seeded third and host sixth-seeded Darien in the quarterfinal-round, in what would be a rematch of last season’s Class LL championship game. Staples, which needed to top Greenwich to have a chance of qualifying for the Class LL Tournament, finished its season with a record of 7-3 under first-year coach Phil Treglia. Senior running back Tysen Comizio, who missed two games with an injury and saw limited action in last week’s win against Xavier, reached the end zone on a pair of 3-yard runs for the Cardinals. He helped pace the home team’s ground attack with 60 yards. Quarterback Gavin Muir, a senior, added a short touchdown run and junior linebacker Evan Weigold returned an interception for a touchdown in the win. Greenwich’s defensive front comprised of Mozi Bici, Emilio Camou, Joe Kraninger and Eddy Iuteri consistently pressured Staples quarterback Jake Thaw and made it challenging for running back Timmy Luciano to find holes to run through. Points were pretty tough to come back in the first half, with both squad’s defensive units stepping up. Greenwich seized a 7-0 lead, when Muir faked a handoff and and snuck through the left side for a 1-yard touchdown with 2:11 remaining in the first quarter. Sophomore running back Hunter Clark, set the Cards up on Staples’ 1-yard line with a 43-yard reception. On the ensuing possession, GHS widened its lead, courtesy of Weigold, who intercepted Thaw’s screen pass over the middle and returned it 33 yards for a touchdown, giving Greenwich a 13-0 advantage at the 1:17 mark of the opening quarter. With Feda and DeLuca each recovering fumbles in Wreckers territory, the Cards threatened to pad their lead. But the visitors kept it a two-score game going into halftime, as sacks by senior linemen George Harrington and Matt Almansi and an interception by senior defensive back Michael Thompson halted Greenwich’s drives. Capitalizing on a short field, following a botched snap on a punt, GHS went 23 yards in six plays to go ahead, 19-0, with 8:33 to go in the third quarter. Comizio’s 3-yard burst up the middle sealed the drive. The next possession, Feda intercepted Thaw’s pass, setting the Cards up at Staples’ 26-yard line. After the drive stalled at the 6-yard line, senior Toby Turnbull kicked a 23-yard field goal, making it 22-0. Bici recovered the ensuing onsides kick, giving the Cardinals the ball at the Wreckers’ 38 an Comizio once again, capped the drive with a 3-yard run, putting Staples in a 29-0 hole with 2:33 left in the third quarter. “Our defensive coordinator Bryan Hocter does a great job of scheming teams up and our defensive line is so tough up front,” Feda said. Greenwich forced six turnovers — three fumbles and three interceptions. … Weigold had two first-half interceptions, while Feda recovered a fumble in the opening half. … Kraninger registered several sacks for GHS, which also got sacks from Bici and Iuteri. … Muir passed for 113 yards for GHS, while Luciano had 69 yards rushing for Staples. Greenwich’s defensive line was tough to handle up front, especially as the game wore on. Weigold and Feda each came up with two turnovers in the victory.